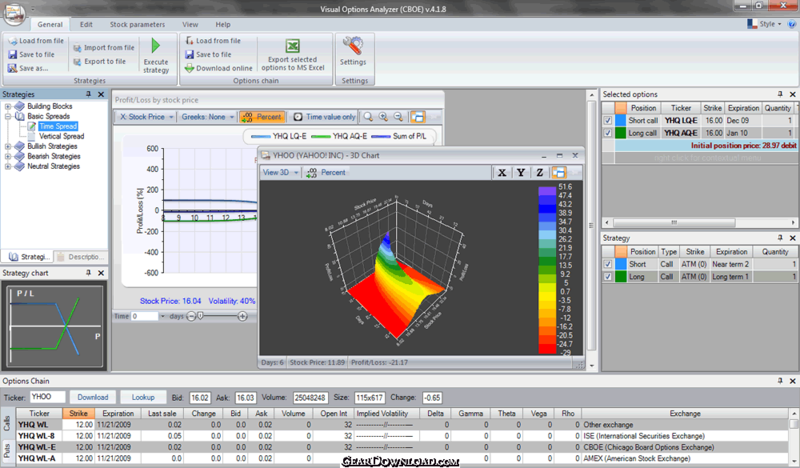 Visual Options Analyzer - Visual Stock Options Analyzer. Build options strategies, hedging. This download (visual_stock_options.exe) was tested thoroughly and was found 100% clean. Click "Report Spyware" link on the top if you found this software contains any form of malware, including but not limited to: spyware, viruses, trojans and backdoors. DownloaderXL Free 7.0.4 - Free quotes for stocks, indices, mutual funds, futures, options, and dividends. BacktestingXL Pro 7.0.3 - Test and evaluate your trading strategies in Excel. Simple strategy creation. BulkQuotesXL Pro 7.0.5 - Download free quotes and apply technical analysis functions in Excel worksheets.